"Fear no color, fear no art, have fun, and always be kind." The beautiful machine that is One Lupine runs on a small but diverse collective. Our vastly different backgrounds, experiences, and skill sets inspire creativity and motivation in all areas of the business. I founded One Lupine Fiber Arts in 2002. My business began with, and has grown from, my deep love of wool and natural fibers. I have a rich background in knitting, spinning, felting and textile design. My business encompasses the wholesale arm of One Lupine (operating since 2003) as well as a retail store focusing on fine craft, art and apparel made in the USA and Canada. Our mission is to call attention to, support, and celebrate the very best in mindful making in North America. We truly want you to enjoy the process of looking, seeing and selecting in our space. We hope that you are delighted, soothed and sustained by the experience. These makers, these people, friends, neighbors, family members, and strangers, are indeed the cultural glue that helps hold us together. Together we remember how it feels to create, to dream, to share, to love, and how to be fully human. 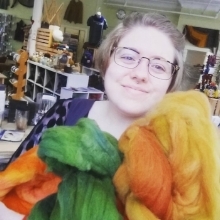 I also own and operate Maine Yarn & Fiber Supply, and unique fiber supply shop, dedicated to promoting Maine based yarns and fibers. In our sunny welcoming space your will find, our line of house yarns and spinning fibers and my own handspun yarn, along side of such well known brands as Peace Fleece, Jagger Spun, String Theory, and more. We are not your usual yarn shop. We offer treasures and stories not found elsewhere. Our house line of Shepherds Choice yarns are all sourced directly from the Maine landscape. It is in these place based yarns and fibers that we breathe, and where we find our sustainability. Our yarns and fibers are sold through our brick and mortar store, this website and through our monthly yarn and fiber mail order club. My business ethic is to promote and support American made work, local economies and endangered craft/skill sets. One Lupine works with over 200 vendors, farmers, growers and artists to create a community of creative making in New England. We host classes, workshops, wonderful retreats, art walks and more in our studio/store in Bangor, ME, and elsewhere. One constant in my life has always been creative expression & the deep innate urge which drives it. A fifth generation needle woman, I learned knitting, crewel embroidery, cross stitch, crochet, needlepoint, trapunto, & sewing at a young age. Being at One Lupine / Maine Yarn & Fiber Supply means being part of a dynamic flow of creative energy, & that’s what feeds my soul! I bring a diverse background in business ownership, marketing, management, & human services coupled with studio experience & professional training in art as therapy. I love to work with customers to bring their creative visions to fruition by choosing design, fiber, & technique. I also love the way plant & animal fibers put us in touch with nature. Nature, in turn, connects us with Spirit and all that sustains us. Helping the local economy, preserving endangered breeds, and keeping “olde world” crafts alive are all worthwhile endeavors which I am proud to be part of. I am the black baby alpaca of the herd. I was born & raised in the Bangor area. I left the Pine Tree State to study fiber/fashion design at Finlandia University's International School of Art & Design, in Michigan’s Upper Peninsula. I have touched on aspects of art including weaving, knitting, garment design, sculpture, dye techniques (including natural and non-traditional), felting, spinning, graphic design and jacquard design. With the help of my loving matriarchs I got my start in fiber early, I have been knitting and sewing for over 20 years. I have an affinity (Joy may call an obsession) for all shades of black, grey, and green. I enjoy caffeinated beverages, corgis, narwhals, and chasing Little Miss Tennessee the shop pup around. Every day at Maine Yarn & Fiber Supply I learn something new and enjoy helping fellow fiber fanatics. I grew up and continue to live on my family's apple orchard. In one form or another, knitting and fiber has been a part of my life ever since I was a child. I remember going to the Union Fair just to see the 4-H sheep show as a child dreaming of owning my own sheep one day! I have been knitting in earnest since I was pregnant with my middle son, who will be 14 in March! I love knitting, spinning, and all things fiber! Oh, and did I mention that my dream came true to owning my sheep?